Made from the finest quality Bristish material, Impress Blinds have a wide collection of quality blinds that are available in multiple colours, patterns and designs from classic wood blinds to stylish roller blinds, vertical blinds, conservatory blinds, roman blinds. We have quality products to provide you the best covering for your home/office in Warrington Cheshire area. 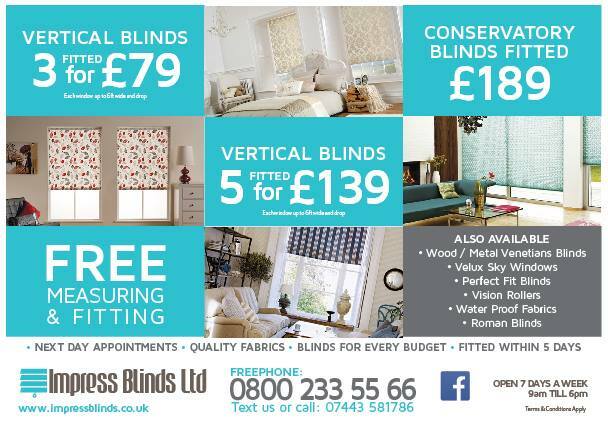 We at Impress Blinds have been supplying and installing cheapest blinds across the Warrington Cheshire and all over the UK. This is why we have hundreds of satisfied domestic and commercial clients throughout UK. Each of our blind is made to the highest standards and comply with all new regulations. So, our blinds are durable, easy to operate and child safe. Made with the finest quality British material, beautiful design and colors, our bespoke made to measure blinds are both practical and decorative at the same time. Our lightweight and easy to clean window blinds are ideal for any room or space including kitchen, lounge, bathroom, conservatory and commercial premises. If you are getting confused in choosing what blinds will be perfect for your home, just share with us. Our experts and advisors will guide you and provide you the best window covering solution to suit your home decor and budget. Moreover, we offer free measuring and fitting services to all our clients in Warrington, Cheshire and to all our UK clients as well. Our major clients in Warrington are much satisfied with our services.